As part of our green management practice all Hicare products are highly advanced with greatest technical competencies. These are the easiest, quickest and most effective way to protect your establishments from flying insects and pests. Usage/Application Hotels, Office, Home, factory etc. 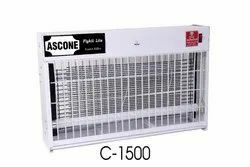 We offer a wide range of Mosquito Killer Machines. 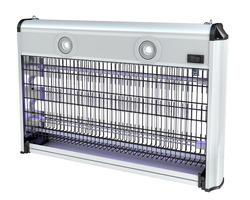 Insect O Cutor Hi Zap 30 watt Electric Fly killer Zapper is a new energy efficient, eco friendly range of Electric Fly Killing Machines for every type of business or domestic use. Insect O cutter Hi Zap 30 watt Electric Fly Killer with it's contemporary design, can be free standing, wall mounted or ceiling suspended whch combine to make the HI Zap Fly Zapper one of the most popular Electric Fly Control Killers available. Heavy use Fly Eliminating in shops, restaurants, catering and commercial kitchens, food processing factories.This Insect O Cutor hi Zap 30 watt Electric Fly Killer. Ideal for lobbies, restaurants and kitchens. Brand :ISS Hicare Warranty Period :1 year On Body (Excluding tube). Product Description: Insect O Cutor Hi Zap 30 watt Electric Fly killer Zapper is a new energy efficient, eco friendly range of Electric Fly Killing Machines for every type of business or domestic use. Insect O cutter Hi Zap 30 watt Electric Fly Killer with it's contemporary design, can be free standing, wall mounted or ceiling suspended whch combine to make the HI Zap Fly Zapper one of the most popular Electric Fly Control Killers available. Pest Management is necessary in Food Processing Industry, Packaging Industries, Pharmaceuticals where stringent standard of hygiene have to be observed and contamination from flies/pets is unacceptable. Note: All Debit/Credit Cards accept here for your handsome purchasing. Application office, hotels, home, factory etc. 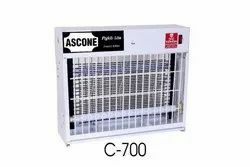 We offer a wide range of Mosquito Killer Machine. The flyzap are available in tow models 16W and 30W and incorporates in deep metal catchment tray,swing open front guard and built from sturdy aluminum construction. The insect control Flyzap is ideal for shops, take-aways, Kitchens and other applications requiring effective fly control at a competitive price. This is 16W, deep metal catch tray, swing open front guard and sturdy aluminium construction. 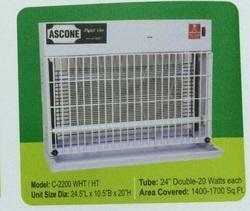 This units comes complete with 2 x 8W black light tubes. Independently tested and certified to RoHS and relevant European standards. It also has a One year guarantee (excluding tubes). Note :All Debit/Credit Cards accepted here for your handsome purchasing.